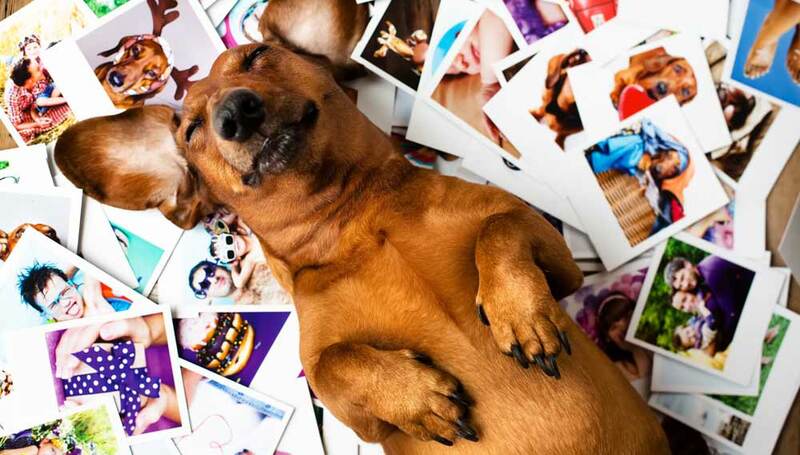 Tons of your most favorite photos in just one gift! Make yourself and your wife, family, boss, mother, father, son, daughter, significant other happy! 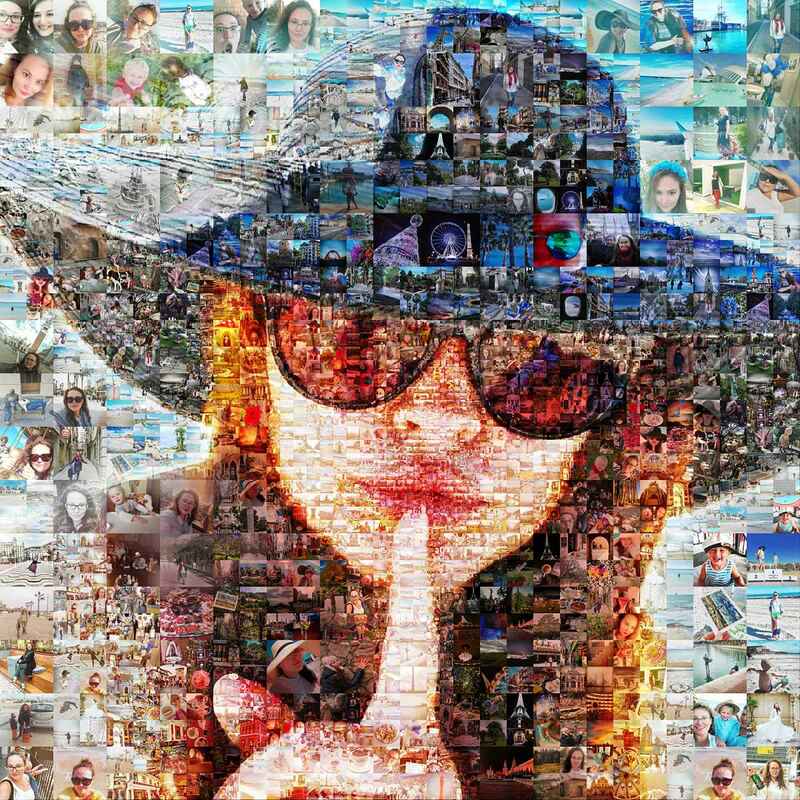 Mosaic photo collage is a whole photo album in one picture! It’s a masterpiece that will surely produce a WOW effect. It’s a creative, stylish and memorable gift for any interior, made with much love by a qualified professional. 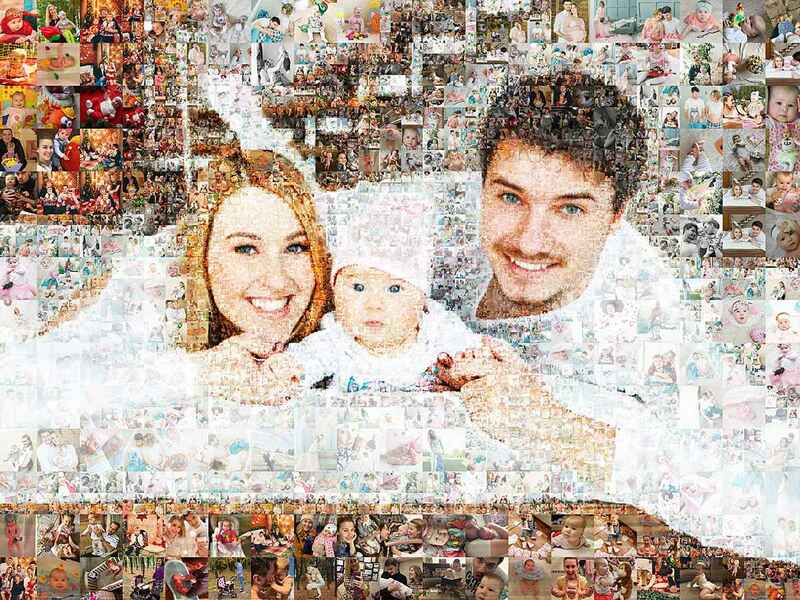 We think our technology can produce the best mosaic photo collages. 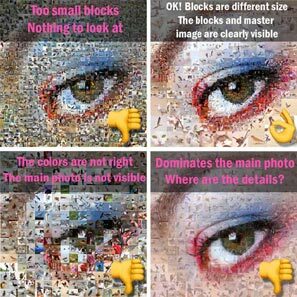 Different block sizes, no blurry faces, the most accurate selection of elements by size and color. 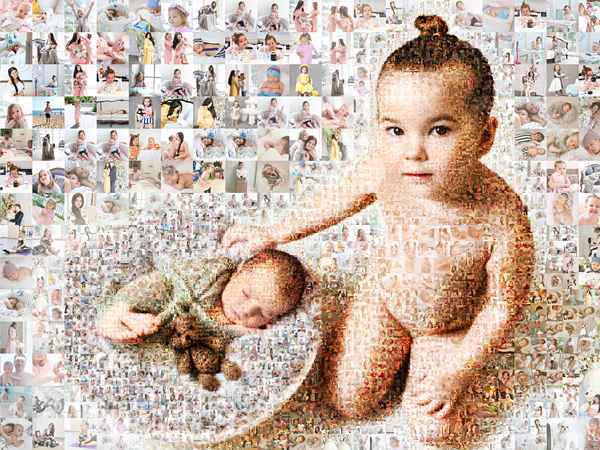 The number and the size of blocks is selected depending on the format of the photo, so that you could examine closely each block on the finished product. We’ve always wanted to simplify the ordering process as much as possible so we decided to provide free worlwide shipping! 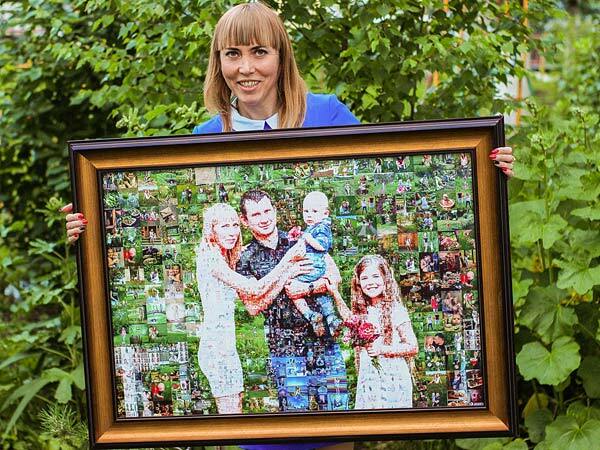 :) Just imagine how pleased your foreign friend from another side of the world will be, the one you talk to through Instagram, when he receives a wonderful mosaic photo collage right at his front door? :) Contact us and we’ll take care of all shipping questions. Our service is the result of our own development line and technologies that we’ve been constantly improving since 1998. 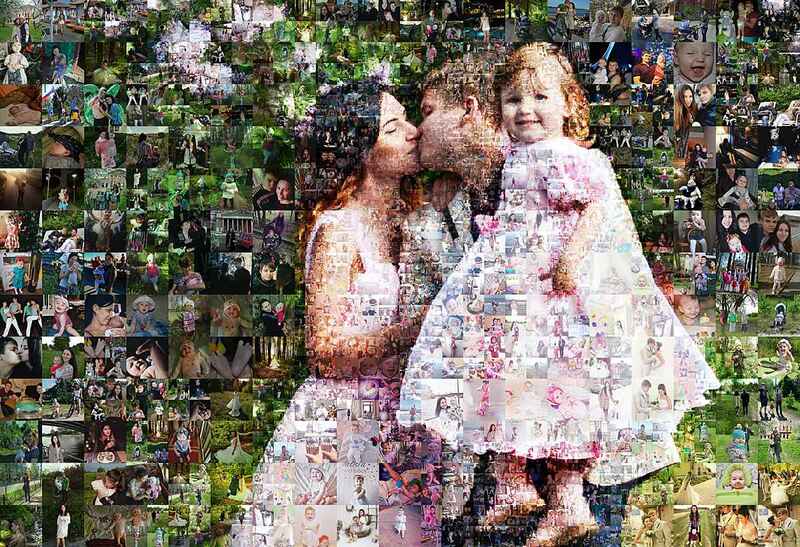 Each photo collage we make has a soul. We’re very careful with the details: earrings, eyes, watches, etc., will all be seen on the finished product. 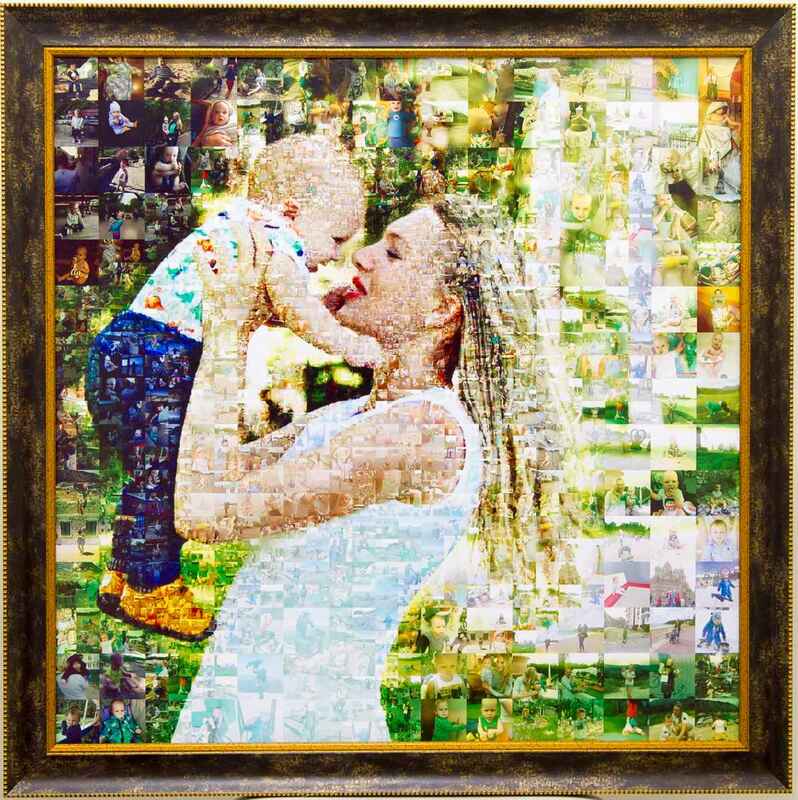 Each photo collage is created with the help of a professional designer, so you can safely say it’s a handmade gift. 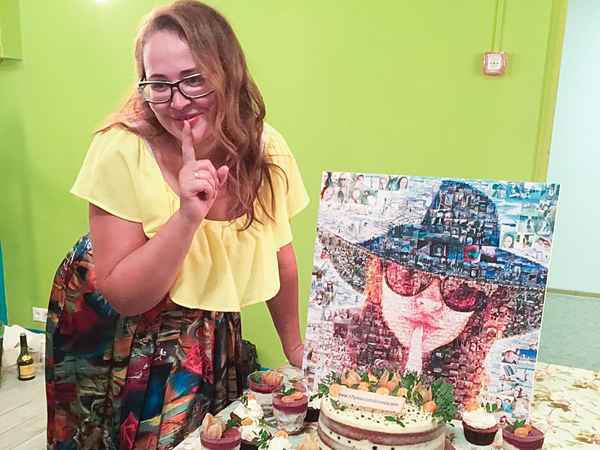 How to select the main photo for a collage (master image)? The master image might be a portrait or any other suitable picture that can be easily spotted from a distance. Our clients often choose a family picture. It’s all about your own imagination and choice, no limits here! 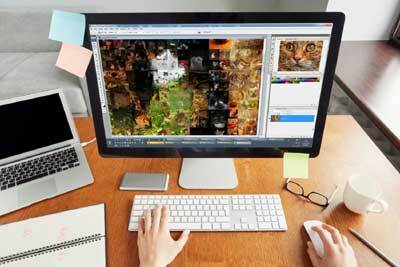 If you select several master images and can’t decide which one is the best, we’ll be glad to help you choose. Don’t hesitate to contact us! 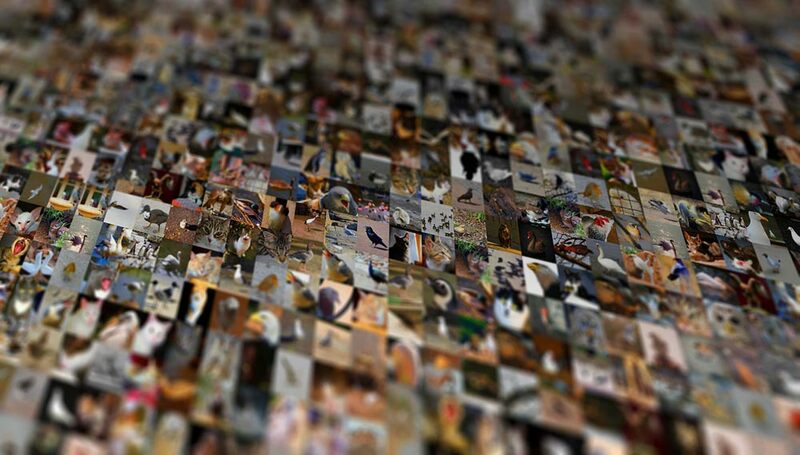 There’s a golden rule for the number of tile photos - the more the better :) We make great collages with 50-100 photos but if you have 300 - it’s even better. There will be almost no duplicate photos, the collage will be interesting and diverse. We can make collages with 1000 and more photos, but in this case some of them may be left out. If you have 300, then almost all of them will be on the collage. What quality should the photos be? Tile photos don’t have to be high-quality and high-resolution, as they will be small on the collage, but the master image has to be of very good quality. The photos should be picked from those you like and should not just be all pictures you own, with duplicates and drafts. 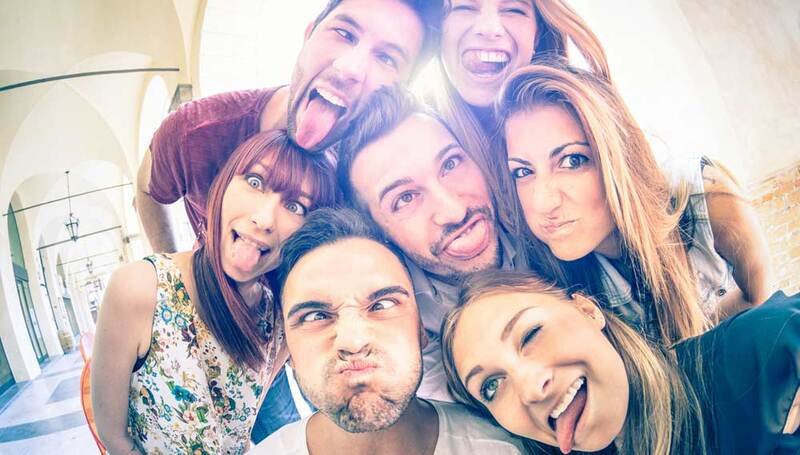 You might have a folder with pre-selected favorite photos, some of them you may have printed or shared with friends at one point. Take some time, pick out the photos for the collage and we’ll take care of the rest! How to send us the photos? 1. If your photos are stored on your phone, in iCloud, on your computer, in DropBox, Google Drive - email us an archive, or send us a link using wetransfer.com, filemail.com, etc. 2. Send the master image to our email mail@collageberry.com or rename the file in the archive so that we could tell this is a master image. 3. If you’d like to make a collage using Instagram account, send us the name of the account where we can download the photos. 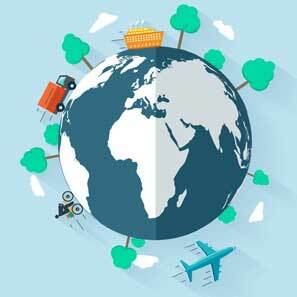 - packaging and courier service delivery “door-to-door” (usually not more than 5 days in the US). We work on 100% advance payment. 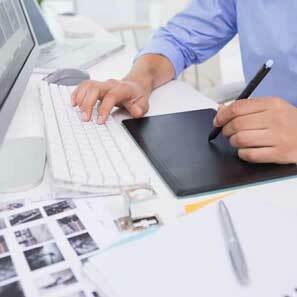 However, your photo collage will be forwarded to print only after you approve the sketch. We guarantee a refund if you don’t like the result. 99.9% of our clients are perfectly satisfied with the result. 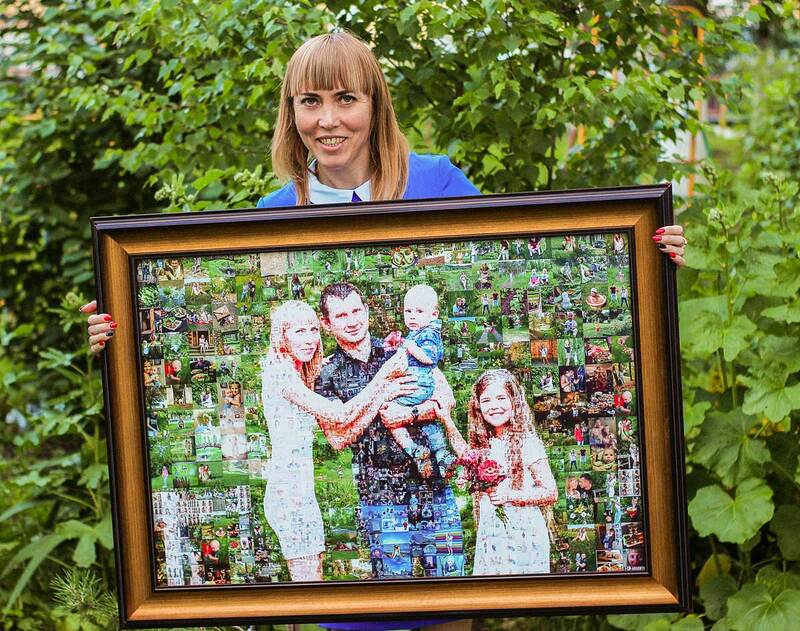 The price depends only on the size of the photo collage. In the table below you can see the popular sizes. We also print in any sizes and proportions. 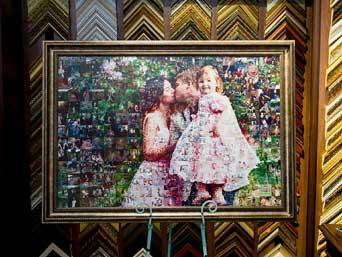 We print on canvas using professional high-resolution printers because we know how important the details are in our line of work. The canvas are stretched on a frame. 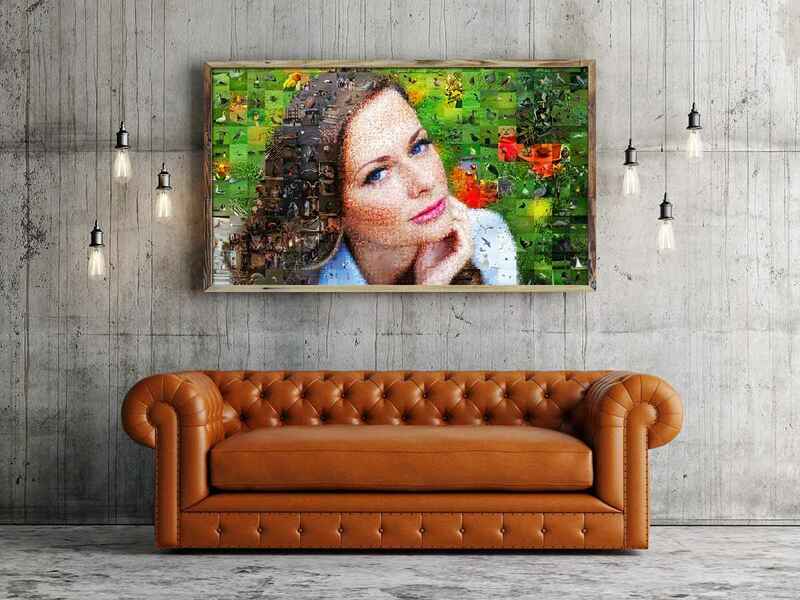 We recommend 24”*36” format as the perfect type for home use: the master image will be well visible and the tile images are large enough to be seen as well. 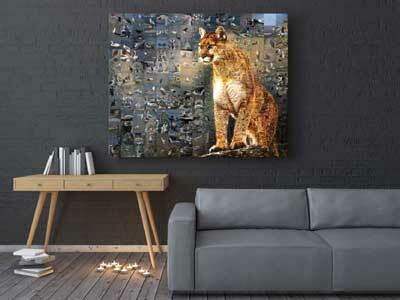 If you’re planning to hang the collage in a spacious room, we can print it in a bigger size. As for shipping and delivery, it’s good when there’s some extra time. 1-2 days for the sketch, 1 day for printing and then time for overseas shipping. However, sometimes the circumstances are that we need to deliver in 10 hours after the order is placed. And it’s possible! :) We’ll send you the collage by email and you’ll be able to print it at your local print store. You can pay any way you like: PayPal, Visa, etc, through the link we’ll send you. We’ll work it out, it’s the easiest. In order to get priority order with a discount - simply pay for our services below and we’ll contact you immediately. 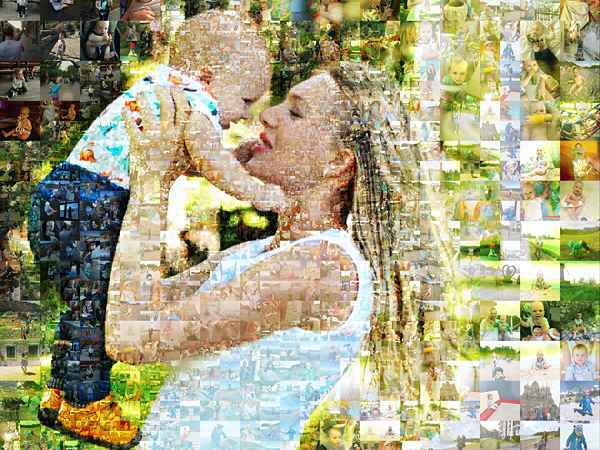 We have the best prices for high-quality mosaic photo collages. Pay right now and get more then 15% discount. Placing an order is very simple. We’ll do all the work for you! 1. Email us at mail@collageberry.com(recommend) or call us +1(757)512-88-85 or personal message on Instagram @collageberry and we’ll accept your order! Or just let us know and we’ll call you back or text you whenever it’s good for you.